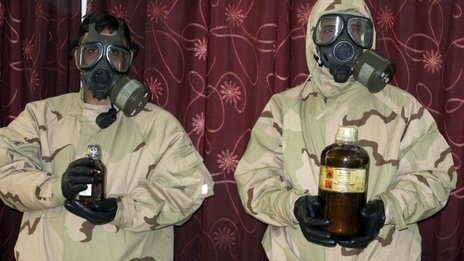 Iraqi authorities say they have uncovered an al-Qaeda plot to use chemical weapons, as well as to smuggle them to Europe and North America. Iraqi defense ministry spokesman Mohammed al-Askari said five men had been arrested after military intelligence monitored their activities for three months. Three workshops for manufacturing the chemical agents, including sarin and mustard gas, were uncovered, he added. Remote-controlled toy planes were also seized at the workshops. Mohammed al-Askari said they were to have been used to release the chemical agents over the target from a “safe” distance of 1.5 km (0.9 miles). All of the arrested men had confessed to the plot, and said they had received instruction from another al-Qaeda offshoot, he added. As the defense ministry spokesman spoke on Iraqi TV, footage was shown of four men with black hoods on their heads, our correspondent adds. Three of them were wearing bright yellow jumpsuits and a fourth was in a brown jumpsuit. Their arrests were possible because of co-operation between Iraqi and foreign intelligence services, Mohammed al-Askari said. Al-Qaeda in Iraq is believed the only offshoot of the Islamist militant network to have used chemical weapons. It detonated a 16 crude chlorine bombs in Iraq between October 2006 and June 2007. Chlorine inhalation made many hundreds of people sick, but no deaths resulting from exposure to the chemical were recorded, US officials said at the time. Instead, the bomb blasts are believed to have caused the fatalities. At the time, US officials said al-Qaeda appeared to want to use debilitating agents like chlorine in their bombs to cause casualties beyond those hit by the initial explosion. US and Iraqi troops subsequently killed or detained many of the militants who were building the chlorine-laced bombs and seized much of their stockpiled chemicals. A letter written by the late al-Qaeda leader Osama Bin Laden five days before he was killed in a US military raid in Pakistan in 2011 urged members of the group’s offshoot in Yemen who he believed were considering using “poison” to be “careful of doing it without enough study of all aspects, including political and media reaction”, according to CNN.